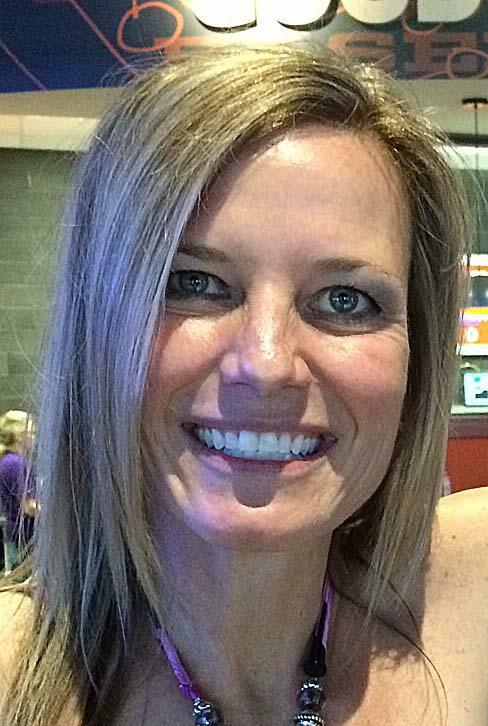 Angela Perkins at the May 16 "Survivor: Ghost Island" viewing party. "Survivor" fans can party with contestant Angela Perkins at Kings Mills' Buffalo Wings & Rings Sunday, before she heads to the finale broadcast live from Los Angeles on Wednesday, May 23. Army veteran Perkins is one of six finalists for the $1-million prize on "Survivor: Ghost Island" (8-10 p.m. May 23, Channel 12, CBS). At 42, she's the oldest contestant still in the game after 13 episodes. The others range in age from 22 to 38. 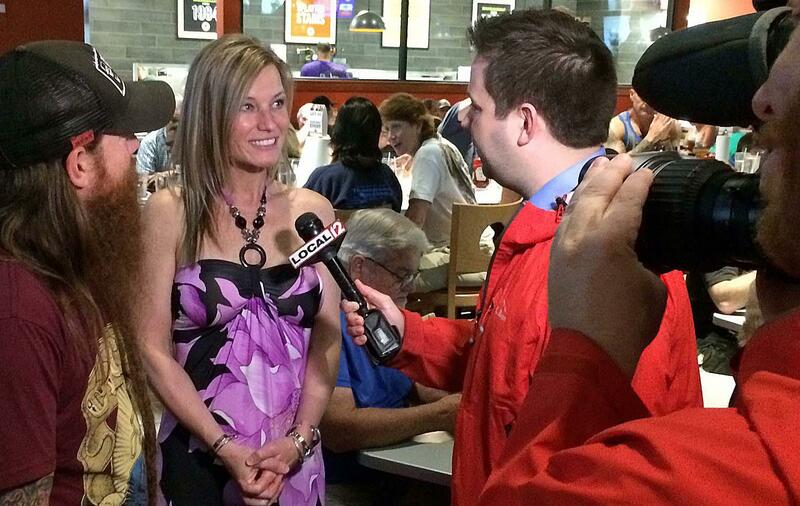 WKRC-TV's Brad Underwood interviews Angela Perkins while 2013 "Survivor: Caramoan" contestant Matt Bischoff looks on. On Wednesday's episode, Perkins wasn't much of a factor. She was the odd person out when the seven castaways picked teams of two for the reward challenge, and she was last in the immunity challenge. Other than that, she wasn't seen or heard much as her dominant Naviti tribe eliminated one of its own, Kellyn Bechtold, 31, of North Manchester, Ind. At a viewing party at the restaurant, Perkins grinned and waved six fingers in the air when Wednesday's show ended. All the restaurant's TVs are tuned to "Survivor" on Wednesday nights. Perkins, who works for the U.S. Department of Veterans Affairs from her home in Oregonia, in rural northeastern Warren County near Fort Ancient, told me she thought the "Survivor" editing was fair. The Iraq and Afghanistan war veteran said she hasn't been seen much because "they want the drama." And that has been provided by strong personalities such as Domineck Abbate, 38, from Nesconset, NY; Donathan Hurley, 26, from Phelps, KY; and Wendell Holland, 33, from Philadelphia. "Survivor" fans have come from Michigan, Indiana, Kentucky, Tennessee and Cleveland, Ohio, to the viewing party. At the end of each show, Perkins puts a big "X" over the photo of the person voted off the island, then signs autographs. 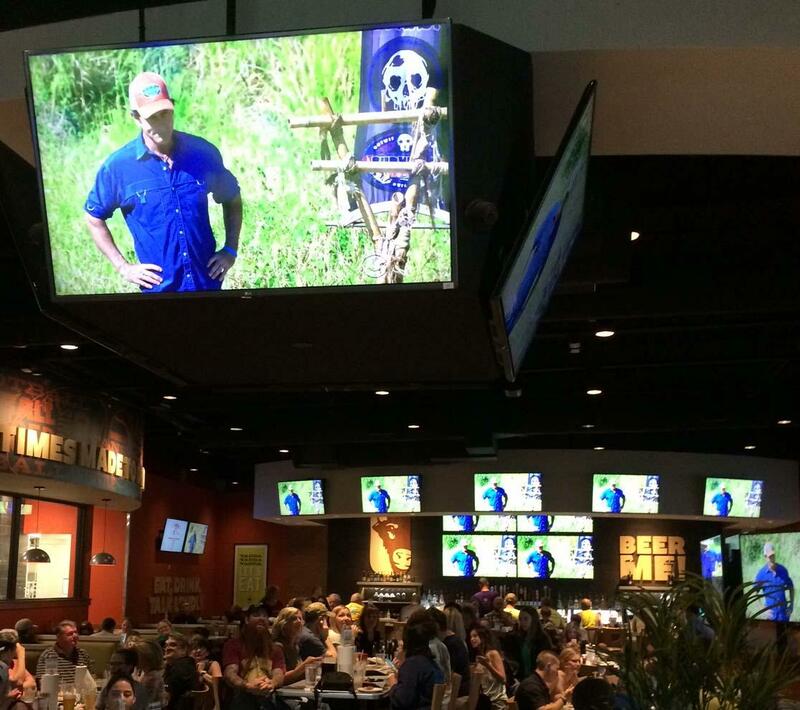 The "Survivor" cast countdown for the finale of Season 36 at Buffalo Wings & Rings. The send-off party will be 2-9 p.m. Sunday at the restaurant, 5517 Kings Center Drive, just east of the I- 71/Kings Mills Road exit north of Kings Island. There will be gift baskets, raffles, an inflatable bounce house, face painting and other activities. Prizes include a gas grill, patio set, fire pit and a patio swing, Perkins says. All proceeds will support the Tristate Veterans Community Alliance, she adds. Bootsy Collins and some past contestants from "Survivor" and "The Amazing Race" also will attend, she says. Perkins also will be at a veterans' benefit in Great American Ball Park's Machine Room before the Reds-Cubs game Saturday. Buffalo Wings & Rings will host a viewing party for the finale Wednesday. The first reviews are in for "Gotti" and they're ugly. 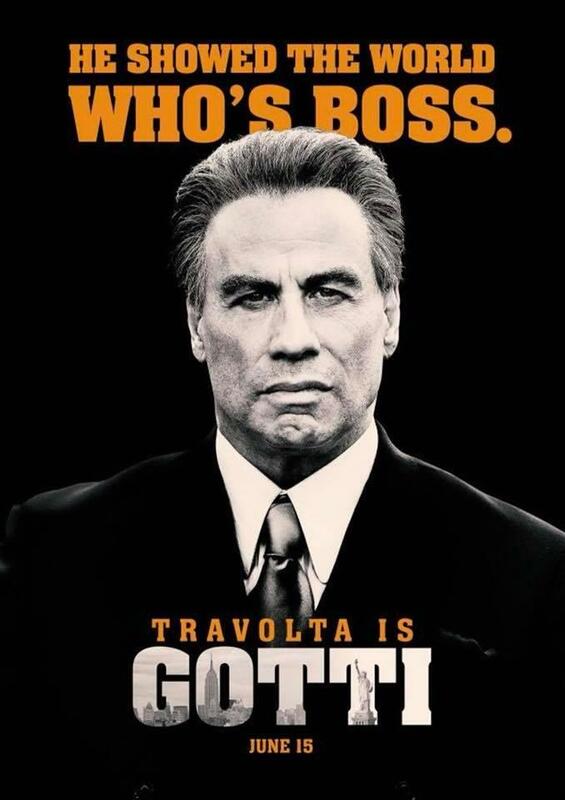 Movie critics at the Cannes Film Festival, who saw John Travolta's biopic about crime boss John Gotti filmed in Cincinnati two years ago, clearly don't think it will be a mob movie hit. Karen Neal / CBS Broadcasting Inc.
CBS keeps turning back the clock this fall, adding revivals of Candice Bergen's "Murphy Brown" and "Magnum P.I" to a fall lineup already featuring "Hawaii Five-0," ""MacGyver," and "S.W.A.T."